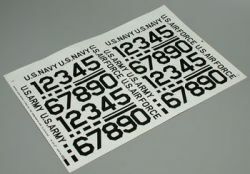 Army, Navy and Air force 2" Black Numbers by Major Decals. Pressure sensitive. The height of the numbers are approx 2 inch (50.8mm) tall.